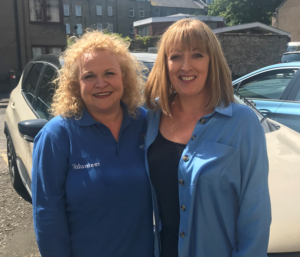 When one of Lynne’s closest friends received end of life care at Ardgowan, she was overwhelmed by the kindness and support shown by all the staff her friend’s family. She vowed to try and help the hospice in some way. Lynne has been volunteering for nearly 3 years and has driven patients 12,105 miles in that time. “I take them to the door and show them exactly where to go, sit with them if they want me too and then take them home to their door. They don’t have to worry about buses, trains and get stressed about parking or worrying that their family will have to miss work by taking them to an appointment. It is a fantastic opportunity to offer help at a difficult and uncertain time in someone’s life. “Some patients are very quiet and I respect that. I get them from their appointment to home with comfort and minimum fuss or bother. Visit our volunteering page or contact Lynsey Young on 01475 726830 or lynsey.young@ardhosp.co.uk.